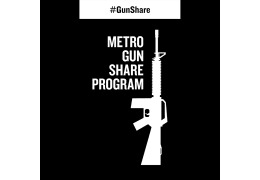 The GunShare concept was developed as a response to the NRA's unending call for increased armament access in the face of, what has now become a commonplace tragedy, mass shootings in the U.S. Columbine, Sandy Hook, Parkland, Virginia Tech, Mandalay Bay. We know the names. We all know why. Tragically, the outrage dissipates as soon as our news and social feeds are updated. What about the names of 650 people that died at the hands of a gun in Chicago last year? The outrage barely registers. We watch reports of the latest mass carnage over our mourning coffee while gun deaths down the block silently pervade the fabric of daily life. Groups are trying to stop this senseless violence, but their work is drowning in noise, often created intentionally to distract; from an issue to diffuse; too hard to consider; too easy to forget. Partnering with The Brady Campaign to Prevent Gun Violence, we used the tradition of protest art as a strategy to force people to consider something tangible, something real. The philosopher Theodor Adorno said, “all art is an uncommitted crime,” meaning art challenges the status quo by its very nature. 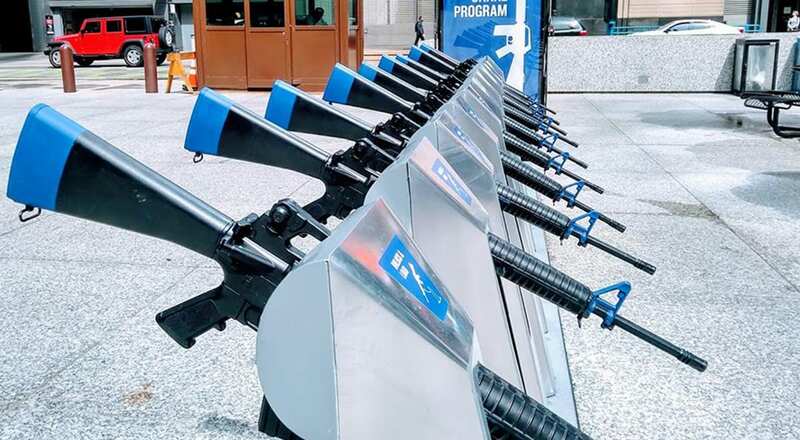 We teamed up with The Brady Campaign, a non-profit organization with the mission of cutting gun deaths in half by 2025, to create the Metro Gun Share Program, an art installation modeled after the city’s popular bike-sharing service. The project is meant to provoke thought and cultural analysis of the NRA's proposed increased access to firearms by juxtaposing the ease in which a person borrows a bike to obtaining an AR-15. The hope is that the public’s engagement with the installation will incite introspection regarding American culture's gun obsession, and uses facts to expose the severe consequences the U.S. is currently facing due to a lack of firearm regulations.